I was first introduced to the Sea Buckthorn in 2011 when my son suffered severe third degree burns to his arm. After a lengthy recovery, he developed major scarring and his rehabilitation therapist recommended using a cream or oil with this ingredient in it. I faithfully applied the oil three times a day to his arm and was very pleased with the results over time. Soon after that I discovered that SeabuckWonders had a full skin care collection featuring the Sea Buckthorn and I have been using it personally ever since. I recently had the opportunity to try several additional products in the line including the Himalayan Sea Buckthorn Facial Cream, the Organic Himalayan Sea Buckthorn Berry Oil and the Himalayan Sea Buckthorn Exfoliating Facial Cleanser. I am 41 years old and long for my former clear, glowing skin which has become dry, dull and is showing signs of skin damage. What I personally like the most about SeabuckWonders is that it is certified organic and the Sea Buckthorn is packed with essential fatty acids including Omega 3, 6, 7 and 9 along with vitamin E and over 190 bioactive nutrients which is exactly what my skin needs to look its best again. I also appreciate that I don’t have to worry about this line containing potentially harmful chemical ingredients as it is free of parabens, cruelty free, vegan and uses only non-GMO ingredients. 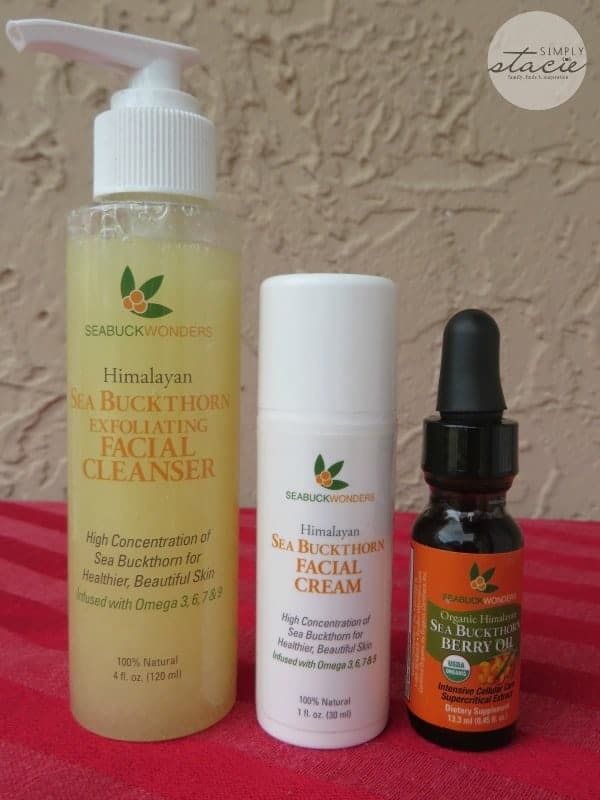 I absolutely love the SeabuckWonders Himalayan Sea Buckthorn Exfoliating Facial Cleanser (SRP $16.97) because it works overtime to remove make-up, sweat, dirt and oils to leave my skin looking and feeling fresh and clean. One problem that I normally have with other brand exfoliating cleansers is that it can be too harsh and drying when used on my sensitive skin but not this one…..it is gentle and yet effective in prepping my skin for the next step of moisturizing it. I also like the fresh and invigorating unisex scent of essential orange oil and that it is pH balanced for all skin types so my husband can use it too. After cleansing, I apply the Himalayan Sea Buckthorn Facial Cream (SRP $19.97) to my face and neck. Designed to help minimize fine lines and protect against damage from the sun and the environment, this is the perfect moisturizer for me to use in the summer because it is highly concentrated and may help me to protect my skin from additional UV-stress. It is 100% natural derived and very moisturizing for my dry skin without being too heavy to use in the hot, humid weather. I also like to use a little of this cream when prepping my skin before applying makeup because it helps it to apply smoother. Finally, I apply a few drops of the Himalayan Sea Buckthorn Berry Oil (SRP $15.97) directly to my most troublesome areas such as the thin skin around my eyes and the dry patches on my cheeks and forehead. I even started applying a few drops to Jacob’s keloid scar on his arm again because he had been complaining that it was itchy and he asks me to reapply every day. There are so many uses for this product and you can learn more about all the possibilities by visiting the SeabuckWonders website which has a wealth of information about the Sea Buckthorn. I find that SeabuckWonders is an effective, attractively priced natural skin care line that is one of my all- time favorites because of how it performs for me. I like that it contains Omegas. I love the facial cleanser. I’d like to try the Sea Buckthorn Deep Hydrating Serum! I like the Sea Buckthorn Deep Hydrating Serum. I visited SeabuckWonders and like that all their supplements are made with USDA-cerified organic sea buckthorn oil. They seem like a very eco-friendly company! I learned that there is such a thing as Omega 7! I like that they contain omega 7. I like the Exfoliating Facial Cleanser. I like and learned that they have omega 7. I love that they don’t test on animals and have no GMOs. They’re also organic and kosher. I learned that their products contain the sea buckthorn. This is a superfruit packed full of powerful antioxidants, vitamins, essential fatty acids and the entire family of Omegas (3, 6, 9 AND also Omega 7). I would love to try them on my aging skin…. Their products include omega acids… very cool! Sounds like a natural and refreshing product. I like the Anti-Dryness Kit. Would love to try this, I just turned 40 and like the fact that it is natural! I love their products! simply amazing! would love to win and try additional products! I would love to try the facial cleanser! I learned that they contain omega 7!